After week with 3 missile attacks, Hamas presses domestic rocketry as it welcomes stabbing, threatening 'difficult days' for Israel. 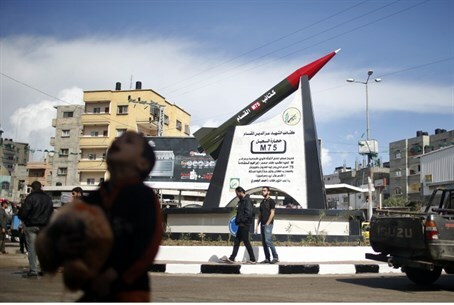 The Hamas terrorist organization on Monday morning conducted a rocket test in northern Gaza, firing a missile into the Mediterranean Sea as part of its domestic development of lethal projectiles. Monday's rocket test comes a day after an Arab terrorist stabbed an Israeli at a gas station on Highway 443 northwest of Jerusalem, lightly wounding his victim before being shot dead by IDF forces. Hamas welcomed the stabbing, saying in a statement on Monday that "difficult days await the occupation." The missile latest test comes after terrorists in Gaza fired rockets at Israel on three separate occasions last week - last Friday night, last Thursday night, and last Saturday night. Most of the rockets hit near the border area or fell within Gaza territory; in at least some cases a local group affiliated with Islamic State (ISIS) took credit for the attacks. Hamas has long been pressing its rocket research due to an Israeli naval blockade preventing the import of foreign weapons, and an Egyptian crackdown on smuggling tunnels from Sinai that has seen thousands of Gazans expelled in the creation of a "buffer zone."